FISH (Fluoresence in-situ Hybridization) is a powerful tool for investigating the relative abundance and physical characteristics of different populations of microorganisms. FISH combines fluorescence microscopy with oligonucleotide probes--precisely designed DNA sequences conjugated with fluorescent molecules that are used to tag, visualize and quantify specific microbes of interest. Geovations multi-color FISH (mFISH) lab uses multiple probes with different color fluorochromes to simultaneously provide quantitative information on different sub-populations in the same sample. 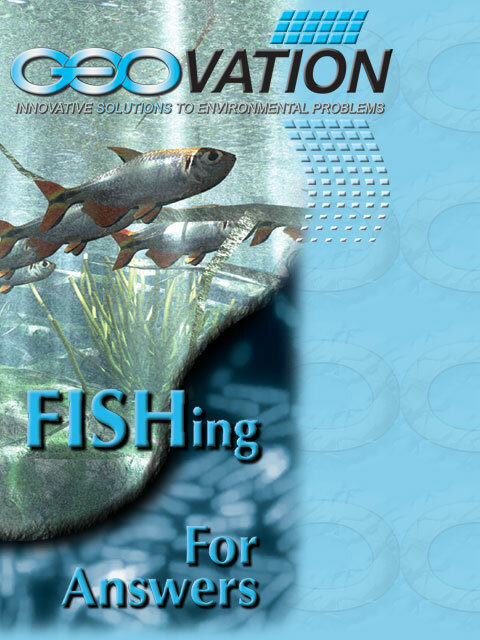 Geovation offers several mFISH assays to provide relatively rapid and cost-effective enumeration of important groups of microorganisms relative to other methods. mFISH also enables the simultaneous visualization of the spatialarrangements of microbes in mixed consortia to investigate the potential for mutualistic or syntrophic interactions among different organisms. FISH provides data useful for applications ranging from biological monitoring of monitored natural attenuation (MNA) programs, bioremediation monitoring and process optimization, bacterial source tracking (BST), medical and public-health microbiology, and problem solving and process monitoring for waste-water treatment. 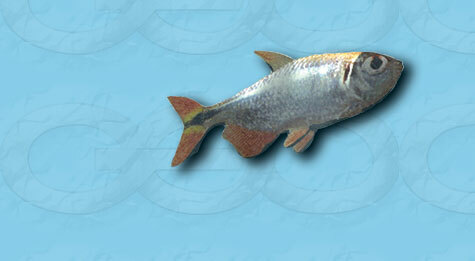 Click on the fish to download the brochure! 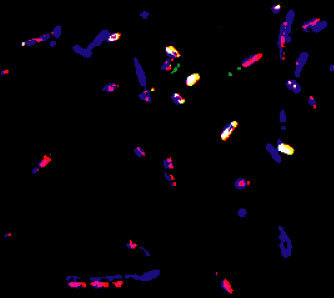 False-color RGB composite bitmap image of a "MP1" mFISH assay showing denitrifying bacteria from a gasoline-contaminated aquifer. Aqua cells are beta-proteobacteria (dual hybridizations with 'blue' BET42a and 'green' EUB338 probes), yellow cells are gamma- proteobacteria (dual hybridizations with 'red' GAM42a and 'green' EUB338 probes) and green cells are undifferentiated bacteria (single hybridizations with 'green' EUB338 probe). 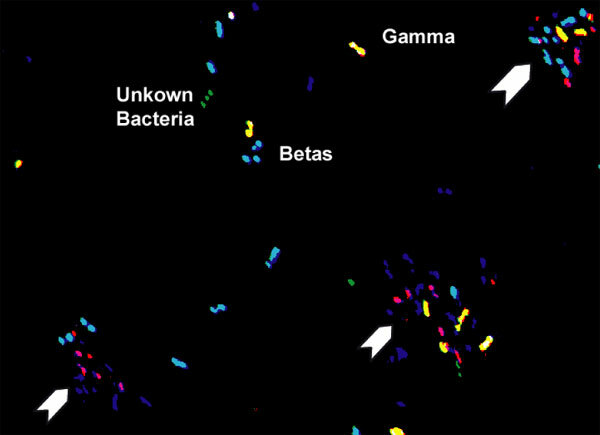 Red, purple, and blue objects are noise from cells within biofilms (arrows). Geovation's FISH Lab Fast-Facts - What ís it all about? 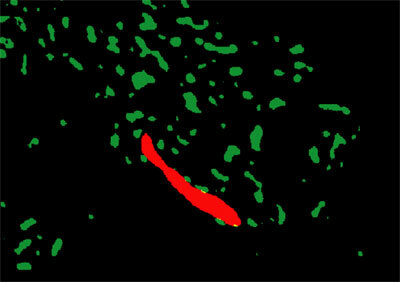 Rod-vibrioshaped delta-proteobacteria cell (Green) attached to coccoid Dehalococcoides ethenogenes ("DHE") cell (Red). Yellow area is where cells overlap. False-color composite image, "MP5" mFISH assay, sample from CVOC contaminated aquifer undergoing active anaerobic bioremediation. DHE cells represent about 9% of total DAPI-stained cells. Reports are provided in Excel or pdf format with data for each target group reported in units of cells/mL and % of DAPI counts. Each FISH assay provides a minimum of 2 to 4 data points per sample -- total cell counts (DAPI staining) along with the cell counts and relative percentages of DAPI counts for each target population. Several mFISH assays are available that provide simultaneous data for 2-4 target populations plus total cell counts (DAPI). Tot. Bacteria (Red-Violet) and beta-proteobacteria (Yellow-White) cells are differentiated from other DAPI-stained cells (Blue) that did not hybridize with either the EUB338 or BET42a probes. False-color composite image from a "MP1" mFISH assay performed on a ground-water sample from a TCE-contaminated aquifer. Bacteria represent about 70% of total DAPI-stained cells, beta-proteobacteria about 30%. Many of the 30% of DAPI-stained cells that did not hybridize with EUB338 may be archaea. Little is currently known about psychrotolerant archaea in the environment and their role in biodegradation and bioremediation. Pseudomonas spp., Bacteroides spp., Bfidobacterium spp. Many probes and several "MP" multi-color, mFISH probe combinations available. Custom assays available on request. 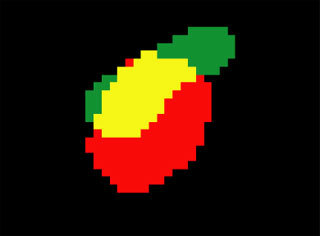 © 2012 Geovation Engineering, P.C.. All Rights Reserved.